XAML resources are definitions of objects that can be shared and re-used throughout a Xamarin.Forms application. These resource objects are stored in a resource dictionary. This article describes how to create and consume a resource dictionary, and how to merge resource dictionaries. 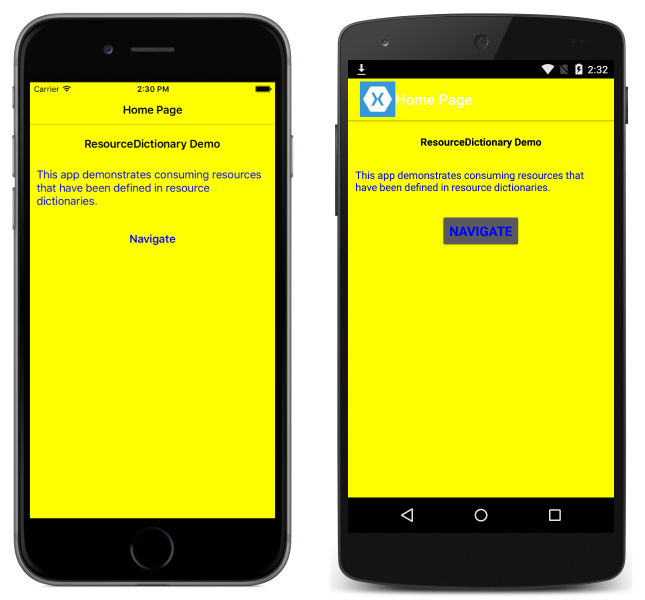 A ResourceDictionary is a repository for resources that are used by a Xamarin.Forms application. Typical resources that are stored in a ResourceDictionary include styles, control templates, data templates, colors, and converters. In XAML, resources that are stored in a ResourceDictionary can then be retrieved and applied to elements by using the StaticResource markup extension. In C#, resources can also be defined in a ResourceDictionary and then retrieved and applied to elements by using a string-based indexer. However, there's little advantage to using a ResourceDictionary in C#, as shared objects can simply be stored as fields or properties, and accessed directly without having to first retrieve them from a dictionary. Resources in a ResourceDictionary that is attached to a view such as Button or Label can only be applied to that particular object, so this is not very useful. Resources in a ResourceDictionary attached to a layout such as StackLayout or Grid can be applied to the layout and all the children of that layout. Resources in a ResourceDictionary defined at the page level can be applied to the page and to all its children. Resources in a ResourceDictionary defined at the application level can be applied throughout the application. This ResourceDictionary defines three Color resources and a Style resource. For more information about the App class, see App Class. <Label Text="This app demonstrates consuming resources that have been defined in resource dictionaries." Resources that are specific to a single page shouldn't be included in an application level resource dictionary, as such resources will then be parsed at application startup instead of when required by a page. For more information, see Reduce the Application Resource Dictionary Size. However, note that the background bar of the NavigationPage is still yellow, because the BarBackgroundColor property is set to the value of the PageBackgroundColor resource defined in the application level ResourceDictionary. Here's another way to think about ResourceDictionary precedence: When the XAML parser encounters a StaticResource, it searches for a matching key by traveling up through the visual tree, using the first match it finds. If this search ends at the page and the key still hasn't been found, the XAML parser searches the ResourceDictionary attached to the App object. If the key is still not found, an exception is raised. A class derived from ResourceDictionary can also be in a separate stand-alone file. (More precisely, a class derived from ResourceDictionary generally requires a pair of files because the resources are defined in a XAML file but a code-behind file with an InitializeComponent call is also necessary.) The resultant file can then be shared among applications. To create such a file, add a new Content View or Content Page item to the project (but not a Content View or Content Page with only a C# file). In both the XAML file and C# file, change the name of the base class from ContentView or ContentPage to ResourceDictionary. In the XAML file, the name of the base class is the top-level element. This ResourceDictionary contains a single resource, which is an object of type DataTemplate. An instance of MyResourceDictionary is set to the Resources property of the ContentPage object. However, this approach has some limitations: The Resources property of the ContentPage references only this one ResourceDictionary. In most cases, you want the option of including other ResourceDictionary instances and perhaps other resources as well. This task requires merged resource dictionaries. Merged resource dictionaries combine one or more ResourceDictionary instances into another ResourceDictionary. You can do this in a XAML file by setting the MergedDictionaries property to one or more resource dictionaries that will be merged into the application, page, or control level ResourceDictionary. ResourceDictionary also defines a MergedWith property. 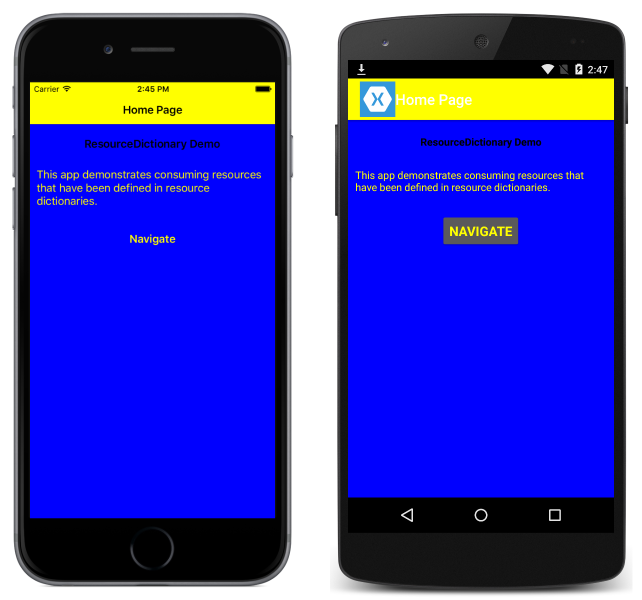 Do not use this property; it has been deprecated as of Xamarin.Forms 3.0. There can be only one MergedDictionaries section in a ResourceDictionary, but you can put as many ResourceDictionary instances in there as you want. The resources local to the resource dictionary. The resources contained in the resource dictionary that was merged via the deprecated MergedWith property. The resources contained in the resource dictionaries that were merged via the MergedDictionaries collection, in the reverse order they are listed in the MergedDictionaries property. Searching resource dictionaries can be a computationally intensive task if an application contains multiple, large resource dictionaries. Therefore, to avoid unnecessary searching, you should ensure that each page in an application only uses resource dictionaries that are appropriate to the page. This new syntax does not instantiate the MyResourceDictionary class. Instead, it references the XAML file. For that reason the code-behind file (MyResourceDictionary.xaml.cs) is no longer required. You can also remove the x:Class attribute from the root tag of the MyResourceDictionary.xaml file. This article explained how to create and consume a ResourceDictionary, and how to merge resource dictionaries. A ResourceDictionary allows resources to be defined in a single location, and re-used throughout a Xamarin.Forms application.